Mrs LEAH BLYTH Of Gt. Yarmouth - Leased to Lacon & Co.
(Full) licence application refused Monday 27th August 1860, as were all the other applications from 24 beerhouses. Isaac Burwood received Final Orders of Insolvency Monday 28th January 1861. A Beerhouse, Lot No. 9 of 16 Lots to be sold upon the instructions of Joseph Tomlinson Esq. Lot No. 1 being a Nine-Quarter Brewery established upwards of fifty years, situated in Howard Street. Joseph Blyth applied for a Wine Licence Friday 28th August 1885. Granted. The first meeting of the creditors of Arthur Stolliday was held on the morning of 14th October 1903. Rent of £7 10s was owing and £218 6s 7d to unsecured creditors. The assets were valued at £45 14s 6d leaving a deficiency of £172 12s 1d. The debtor had been in the trade for thirteen years and had taken the Bricklayers in December 1901. Having no capital of his own he had borrowed funds and no books had been kept regarding trade. The debtor argued that the sole cause of his insolvency was betting. He had sold some of the household effects for £13 and had used the money to file the petition of bankruptcy. 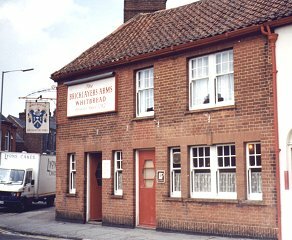 Found as the BRICKMAKERS ARMS, 20A Victoria Road or 61 Nelson Road Central in 1934, 1937, 1959 & 1997.